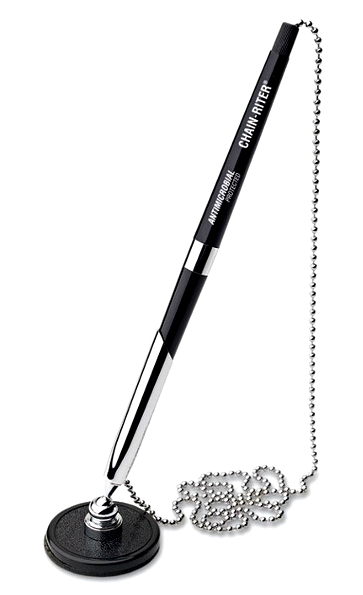 The Chain-Riter stick-on counter pen has a black, hard rubber base that won't crack or break. Swivel socket and pen holder are all chromed metal. 26-inch long ball chain secures pen to base. Affixes to counter with tough, double-coated adhesive. Metal tip on pen eliminates cracked tips. Black ink with fine point. Chain-Riter stick-on counter pen, hard rubber base, swivel socket, 26-inch long chain.